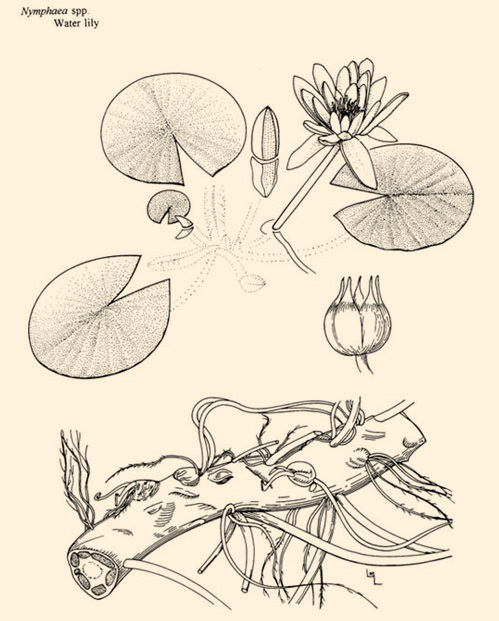 There are many species of Water Lily plants; two of the more common types of rooted floating leaf plants are White Water Lily (Nymphaea spp.) sometimes referred to as Spatterdock and Yellow Water Lily (Nuphar spp.) sometimes referred to as Fragrant Water Lily. The obvious white and yellow flowers identify each type. Water Lilies can spread rapidly to water depths of four to five feet. To achieve relief from lilies taking over a pond or to create access to the lake the best option for control is the application of a granular herbicide like Navigate Granular or in some cases Rodeo or Shore-Klear. The White Waterlily, is an aquatic flowering plant of the family Nymphaeaceae. It is found all over Europe and in parts of North Africa and the Middle East in freshwater. The best method is the application of Navigate, a granular herbicide that is easy to apply. Navigate Granular works systemically to insure control of the roots for long lasting control. We recommend Navigate for most lily situations because the granular is easy to spread. It is not necessary to cover the pads with Navigate just get the granules into the waster within the treatment area. Rodeo (larger container) or Shore-Klear (smaller container) each with the same effective active ingredient are liquid remedies for easy to reach lily areas. They must be sprayed onto a dry pad without washing them off. We recommend spraying from a dock or the shoreline. If you use a boat you must be careful not to create waves that will wash off the pads immediately after treatment. Same systemic action as Navigate. We do not recommend cutting. The lily’s thick tubers make cutting difficult and re-growth can occur within just a few weeks. A.Navigate can be used all season. Water temperatures ideally should be sixty degrees and above. Generally, as long as the plants are vibrant they will respond well to treatment. Rodeo and/or Shore-Klear tend to perform best when the plant is mature. 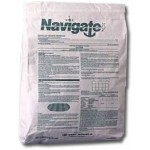 The Navigate granules can be spread by a small Hand held spreader or can be tossed by a hand scoop. 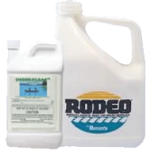 The liquid Rodeo or Shore-Klear is mixed with water and sprayed with a Solo Backpack sprayer or a smaller hand tank sprayer available at nearly all hardware or home supply stores. 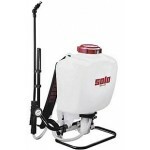 Note: Backpack sprayers cost more but they hold more product, get the job done faster and are much easier to use than carrying a hand held sprayer that are awkwardly carried and require frequent stooping, filling and pumping. Once you use a back pack sprayer there is no going back – You can use it for all your yard weed control and fertilizer applications or use it to apply Flight Control goose repellent. Q. How often do I need to treat the Lilies? A.Lily control can last anywhere from two to four years or more depending upon adjacent lily influence. Two applications may be required initially. Navigate, Rodeo and Shore-Klear kill the roots for longer control. A.Generally within ten days the edges will begin to yellow and curl. The plants will drop from the water column within three weeks.